Fill in your details below and we will let you know within 24 hours if we can get Pandemic: Fall of Rome to you with haste! At the height of its power, the Roman Empire held more than two milion square miles of territory containing over a hundred million people. Throughout the centuries of its extistence, the Empire brought major advancements in engineering, architecture, science, art, and literature. By the beginning of the 5th Century, decades of polictical corruption, economic crisis, and an overburdened military had exacted a severe toll on the stability of the Empire. This paved the way for severe incursions from aggressive barbarian tribes, leading to a decline from which Rome would not recover. Citizens, soldiers, and allies of the Roman EMpire unite in Pandemic: Fall of Rome! Raise armies, defend your cities, and forge alliances to ward off the relentless incursions. Can you hold the line against the invading hordes and prevent the fall of Rome? 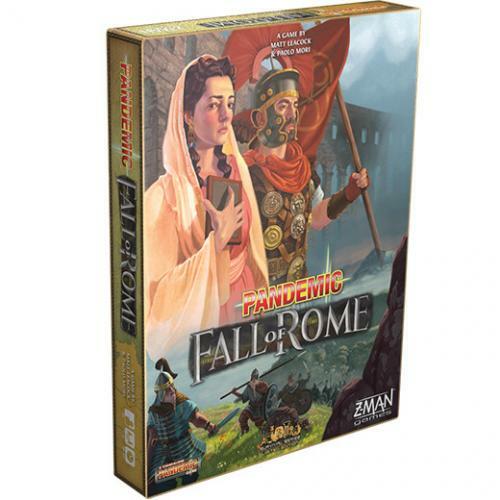 Pandemic: Fall of Rome is a cooperative game in which players all win or lose together. Your goal is to ally with and/or eliminate each of the five invading barbarian tribes before the Roman Empire is overwhelemd. You and your teammates can lose in several different ways: if either Roma or too many other cities are sacked; if any tribes have overrun ROman territory; or if the Empire's resources have run dry. Each player has a specific role with special abilities to improve the team's chances. Choose between the Consul, the Magister Militum, the Mercator, the Praefectus Classis, the Praefectus Fabrum, the Regina Foederata, and the Vestalis. Solitaire rules provide additional options for a lone player, and after you're familiar with the game, you can use the included difficulty levels and the "Roma Caput Mundi" variant to make the game even more challenging. Prevent the Fall of Rome! Protect the capital from the barbarian hordes through sword or diplomacy! Get your copy of Pandemic: Fall of Rome today!